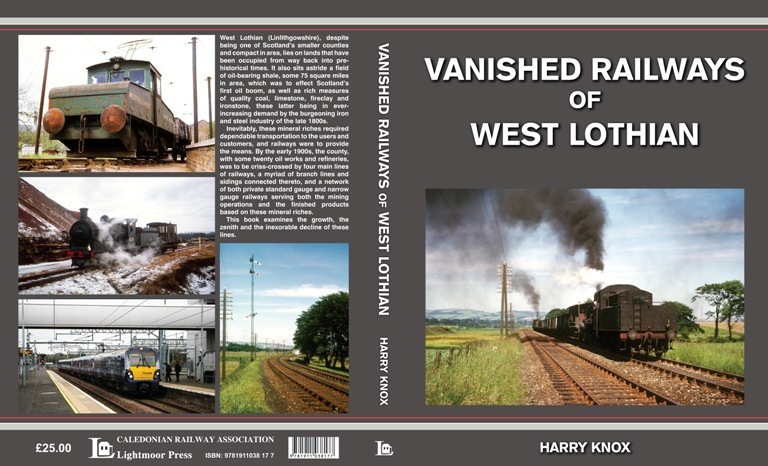 The latest title to be published by the Caledonian Railway Association and Lightmoor Press examines the growth, the zenith and the inexorable decline of the railways built to serve the industries exploiting the mineral wealth of this small area of Central Scotland. West Lothian (Linlithgowshire), despite being one of Scotland’s smaller counties and compact in area, lies on lands that have been occupied from way back into prehistorical times. It also sits astride a field of oil-bearing shale, some 75 square miles in area, which was to effect Scotland’s first oil boom, as well as rich measures of quality coal, limestone, fireclay and ironstone, these latter in ever-increasing demand by the burgeoning iron and steel industries of the late 1800s. Inevitably, these mineral riches required dependable transportation to the users and customers, and railways were to provide the means. By the early 1900s, the county, with some twenty oil works and refineries, was to be criss-crosysed by four main lines of railways, a myriad of branch lines and sidings connected thereto, and a network of both private standard gauge and narrow gauge railways serving both the mining operations and the finished products based on these mineral riches. The book comprises 256 pages of text and illustrations, 275 mm. by 215 mm., printed on gloss art paper with colour laminated printed board covers and is lavishly illustrated with 335 illustrations, made up of some 20 OS map extracts, a small number of route diagrams and over 300 photographs. The book will be launched at the Glasgow Model Rail Exhibition 2017, 24 - 26 February. The book is available by Mail Order, from the CRA Stand at Exhibitions and at our Glasgow meetings. Publishers' usual price for the book only : £25.00 + £5.00 p&p to a UK address. Caledonian Railway Association members enjoy a special discount price of £22.00 for the Book plus £5.00 p&p to a UK address. Mail orders can be placed using the button below for online payments or by post using the order form here. If you have chosen to collect your purchase at one of our meetings or an exhibition please indicate where you will be collecting the book in the Special Instructions within the PayPal payment screen.